KUNG FU JUNGLE is the first Asian film that top the weekend box office chart in Singapore this year! The movie, which was released theatrically islandwide on 30th October, collected a stunning SGD $820,000 over 4 days (30 Oct - 2 Nov) taking the number 1 spot at the local box office chart over the weekend! The impressive weekend performance also puts KUNG FU JUNGLE as Donnie Yen’s highest grossing weekend box office movie over the past 4 years, beating titles like ICEMAN (2014), SPECIAL ID (2013), THE LOST BLADESMAN (2011), etc. Mr Lim Teck, Managing Director of Clover Films and co-distributor of KUNG FU JUNGLE in Singapore, expressed that he is thrilled with the movie’s opening weekend performance and believes that the movie will surpass SGD $2 million at the end of film’s run. KUNG FU JUNGLE is an action blockbuster directed by Teddy Chen and starring Donnie Yen, Wang Baoqiang and Charlie Young. 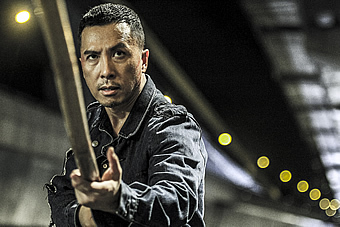 The movie revolves around how martial arts instructor (Donnie Yen) who was imprisoned after killing a man by accident during a fight helps the police academy crack the case of a vicious killer (Wang Baoqiang) starts targeting and killing martial arts masters following the order of a martial arts formula.